Each day that Congress delays acting on the Dream Act from now until March 5, 2018, approximately 122 people will lose their Deferred Action for Childhood Arrivals (DACA)protection. That is 851 people each week, and more than 7,900 since the announcement. The logic behind this number is straightforward: The 22,000 eligible DACA recipients who did not successfully apply to renew their DACA will, as a result, see their DACA protections expire in the 181 days between September 5, 2017 and March 5, 2018. DACA has allowed nearly 800,000 young people who came to the United States as children to live, work, and study without fear of detention and deportation. When President Donald Trump terminated the program on September 5, 2017, he gave the 154,000 DACA recipients whose protections were set to expire between then and March 5, 2018, just 30 days to submit costly and arduous renewal applications. The administration presented its phase-out approach as the “least disruptive” way forward and claimed that it would afford Congress six months to take action before current DACA recipients began to lose protection. But the reality is that with every passing day, DACA recipients lose their protections and become vulnerable to a regime of enforcement overdrive. Shortly after the October 5 deadline, the U.S. Department of Homeland Security announced that 22,000 DACA recipients did not meet the Trump administration’s arbitrary deadline for renewal. Much as the administration is currently attempting to sabotage open enrollment for Affordable Care Act coverage by shortening the enrollment period and pulling back from promotional efforts, the administration did nothing to encourage eligible DACA recipients to ensure that their renewal applications were received on or before October 5. Moreover, it ignored bipartisan requests to extend the enrollment period, particularly for people in hurricane-stricken areas like Texas and Florida. Losing DACA comes with profound consequences. Without DACA these young people will no longer be protected from detention and deportation. This is especially worrisome given that DACA recipients entrusted the federal government with personal identifying information for themselves and their family members long before the Trump administration expanded its deportation priorities to cover just about any unauthorized immigrant. In fact, months before the Trump administration terminated DACA it had already arrested and detained a series of DACA recipients, including Daniel Ramirez Medina, Riccy Enriquez Perdomo, and Daniela Vargas. Once their DACA expires, these young people will lose their work authorization and likely be forced out of employment. 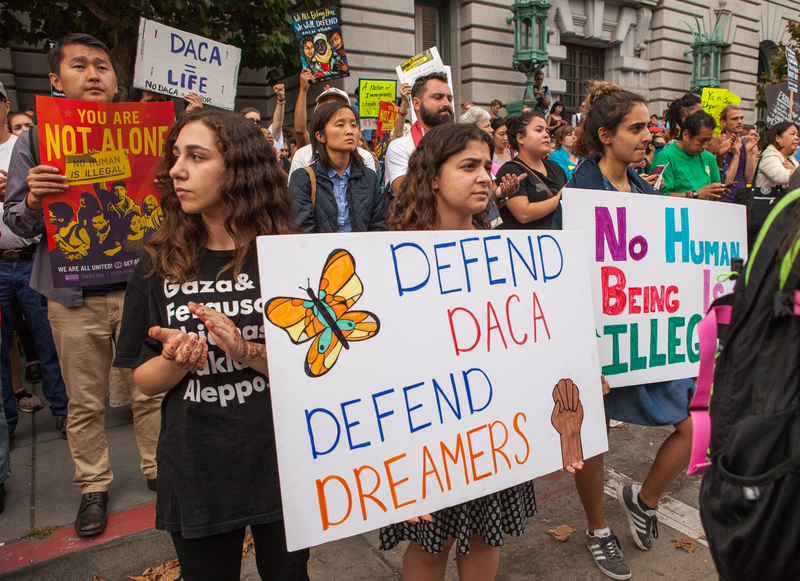 The largest survey of DACA recipients found that 91 percent of those with DACA were employed. Losing their jobs will have repercussions for DACA recipients that reverberate with their families and their employers who will incur at least $3.4 billion in turnover costs. Another consequence of losing DACA is that many of these young people will lose their access to a driver’s license. While DACA recipients may obtain driver’s licenses in every state, licenses are only available to the larger unauthorized population in 12 states and the District of Columbia. Lastly, without DACA many young people will face new barriers to pursuing higher education. While at least 20 states offer in-state tuition to unauthorized immigrants, other states extend in-state tuition only to DACA recipients. Losing the ability to pay in-state tuition could make it extremely difficult for some to afford tuition and enroll in the upcoming spring semester. One such state is Virginia. Ángel Cabrera, president of Virginia’s George Mason University, estimates that, once their DACA expires, between 150 and 300 currently enrolled students may be unable to afford tuition and be forced to leave the university. By March 5, 2018, approximately 22,000 DACA recipients already will have lost status and face the challenges listed above. But that number will only be the beginning. Come March 6, 2018, the number of people losing DACA each day will significantly increase, until no protections remain for the nearly 800,000 Dreamers who have been making enormous contributions since they first received DACA. When members of Congress and the president talk about delaying consideration of the Dream Act until some time in the future, they are not only playing with the fears and anxieties of hundreds of thousands of DACA recipients who stand to lose protection beginning in March, but are discounting the real harms already taking place for tens of thousands of DACA recipients. Advocates that regularly call upon Congress to pass the #DreamActNow are focused not only on averting the crisis ahead of us, but also preventing the ongoing crisis from getting any worse. Tom Jawetz is the vice president of Immigration Policy at American Progress. Nicole Prchal Svajlenka is a senior policy analyst of Immigration Policy at American Progress.